A breakdown of how internet users go online, including those with home access overall and the type of access (dial-up or broadband), is shown in this table. Though our May 2013 survey did not explore how internet users without home access go online, it is likely that friends and family, workplaces, and community resources such as libraries may all play a role. 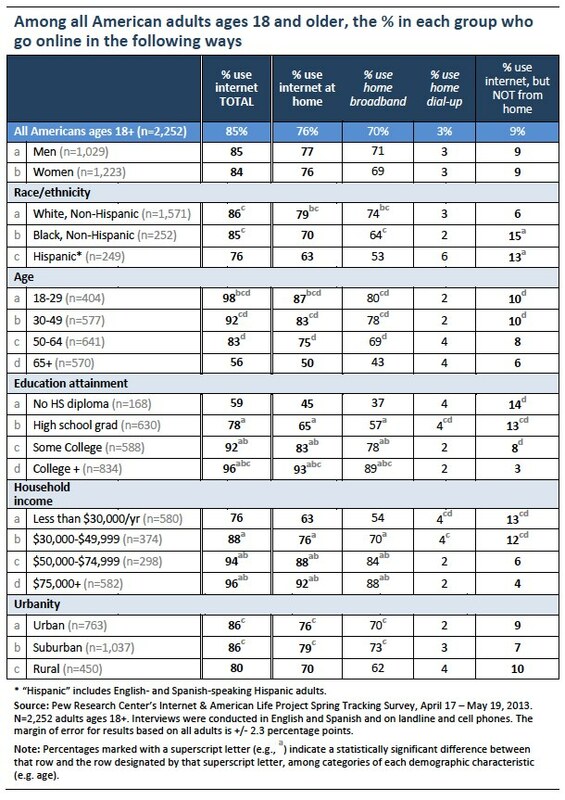 In a 2012 survey of Americans ages 16 and older, for instance, 73% of respondents said there are places in their community where they can access the internet or use a computer for free, and 35% say they have used those free access points.Additionally, previous research on smartphones and home broadband adoption has found that 10% of adults ages 18 and older say they have a smartphone, but do not have a home broadband connection, indicating that they may rely on their smartphone for a form of “home” internet access.